OK, it is just a week before Christmas and you are not ready. Before you throw your hands up and surrender, stop for a minute and evaluate what you CAN get done to make this holiday memorable. Here is a step-by-step guide on guide you through so you get the basics done before the holiday. The first thing you should do is make a list of what you need to do. Let’s face it, you don’t have time to run around like a chicken with your head cut off! Every minute counts and the more organized you are, the more productive you will be. I am including a copy of a last minute To-Do list to be sure you get the basics done. There are just a few simple steps (ok, except the step abut putting up the tree) that can be done in just a few minutes of your time. Cookies for Santa – don’t forget to put the cookies out for Santa! And a glass of milk! And don’t forget carrots for the reindeer! The better you are organized when leaving the house, the more effective your errands will be. Before you leave the house, make sure you take with you any coupons or lists you have. One of the biggest time-savers I have found is being able to buy stamps AND gift cards for many retailers right at the grocery store. 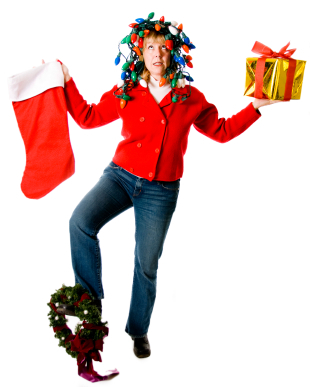 So you may have to be a bit flexible when it comes to store selections or gift card amounts, but seriously, IT’S JUST A WEEK BEFORE CHRISTMAS!!! Last Minute Correspondence For everyone that thought it was just way too later to properly wish your family & friends a Merry Christmas & Happy New Year – it’s not! The US Postal Service is working really hard to help folks spread their holiday cheer, but you need to ACT FAST so your wishes get there in time. 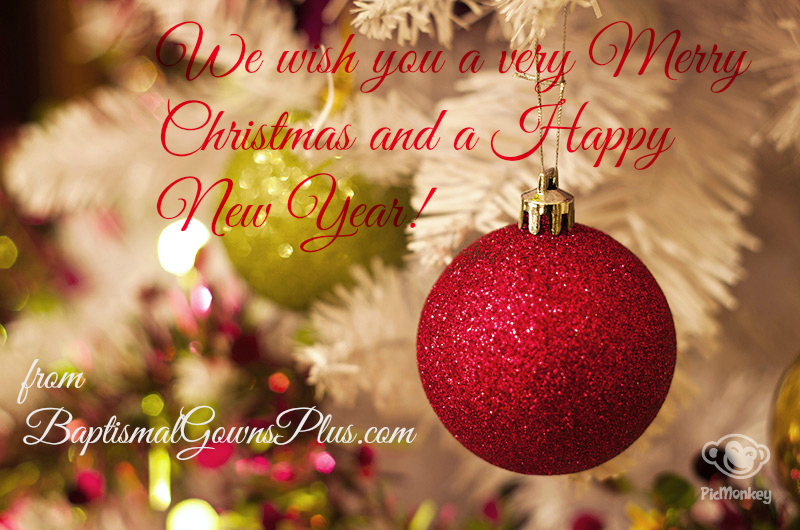 Facebook/Twitter Post wishing everyone a Merry Christmas – While Christmas cards can be sent to your closest family & friends, a lovely heartfelt post on Facebook or Twitter can reach more distant friends. Thank you notes to staff – A must-do for this time of year. Taking a few moments to write a heartfelt card expressing the gratitude you have for your staff goes a long way for making them feel appreciated. The key here – handwritten notes. Your staff will know and appreciate that even at this busy time of year you took the time to focus on them. Thank you notes to customers – Another must-do for this time of year. A heartfelt card expressing the gratitude you have for your customers is necessary to maintain relationships you have taken all year to build. If possible – handwritten notes to your largest customers. 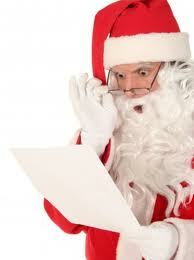 For companies with many, many customers, a printed card will have to do – if possible, a handwritten signature perhaps? Last Minute Miscellaneous Tasks You could probably write a list of things you want to get done that is a mile long, but there is no sense getting caught up in the miniscule details that won’t let you enjoy your family time this holiday. Focus on the biggest things and be happy! Key words there – FOCUS and HAPPY!!! Wrap gifts – prioritize your gift wrapping by doing the gifts that need to be handed out first – teachers, bus drivers, staff – and then move on to the gifts for your hostesses and finally your family since those gifts will be given out last. And yes, you won’t be alone if you are wrapping gifts after the kids go to bed on Christmas Eve! Put out cookies for Santa & carrots for reindeer – don’t forget to do this before the kids go to bed on Christmas Eve! You don’t want to give anyone an excuse to get out of bed on Christmas Eve because they realize they forgot to leave a treat for Santa. Especially if the elves are still wrapping gifts! Follow Santa on a Santa Tracker – There are several apps and online websites that track Santa’s journey around the world on his way to your house. This has proven to be the best way to get kids to bed on Xmas Eve! They have to be asleep so Santa can actually come!!! 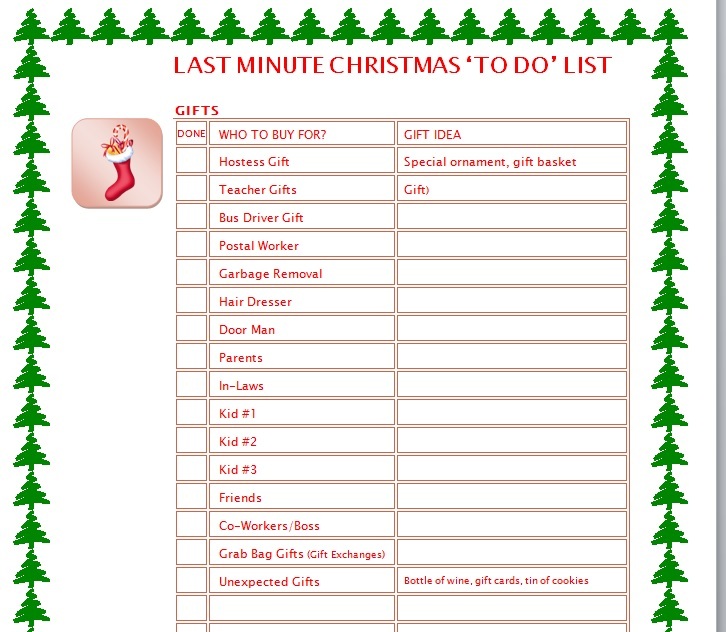 Last Minute Gifts Gift buying can actually take the longest time of all the tasks you have left to do. Remember that the most memorable gifts you can give are possibly to most unexpected. A generic gift card is nice for most folks, and I certainly love to get a gift card to Dunkin’ Donuts or Starbucks, but have you ever thought to give a gift certificate book to the local car wash, or how about the local movie theater? Gas cards are also a nice treat that most folks might not think of. Keep in mind that people who get gifts from many folks (teachers, bus drivers, hair dressers) might very well appreciate even the ‘generic’ gift card over a tchotchke (aka chachki) item like a Worlds Greatest Teacher mug filled with hot chocolate fixings… although the hot chocolate might be nice, they really don’t need 30 mugs from this Christmas alone…. Don’t forget to have a few extra gifts stashed away for that awkward exchange when someone hands you a gift and you just weren’t prepared to give them something…. some items that you can have ready include – bottle of wine, gift cards, tin of cookies and nice ornaments. Go as far as actually wrapping these gifts (including a bow) and marking them with a post it note with the contents. This will help to disguise the fact that you didn’t think there would be a gift exchange with them this year….